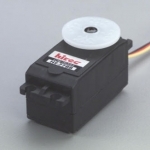 This water resistant servo features One ball bearing on the output shaft. One internal metal gear (NOT THE OUTPUT GEAR, it is nylon). This works well in boats that require a lower than normal servo, for example a catamaran.